(MENAFN - Khaleej Times) "I couldn't believe she would walk that long, but she did it," said Nivine Salah, mother of 15-year-old Jaida Mohammed who accepted the Dubai Fitness Challenge despite being born with mild cerebral palsy that caused her movement difficulties. The Egyptian family was part of the "Together We Can" inclusive community initiative at the Sustainable City that saw walkers, joggers and runners pushing disability running chairs for 30 minutes in a bid to encourage determined ones to adopt a healthy lifestyle and integrate them with the community. Jaida's twin brother Muaz, with severe cerebral palsy, accepted the challenge on his wheelchair. Split into three groups, Jaida walked with her mother as they both were supported by other community members, while their father Mohammed Salah ran besides his son's running chair, which was pushed by runner Ahmed Zendaqi, a Dubai resident. The family had just moved to Dubai from Cairo a month ago, taking the event as an opportunity to socialise with Dubai residents and encourage their determined children to adopt sports into their lives. A cardiologist by profession, Mohammed said: "Exercising must be a lifestyle, but unfortunately we use our busy schedules as an excuse to skip it." His daughter Jaida agrees that "it's exhausting, but I feel more active and I want to do it every day now." 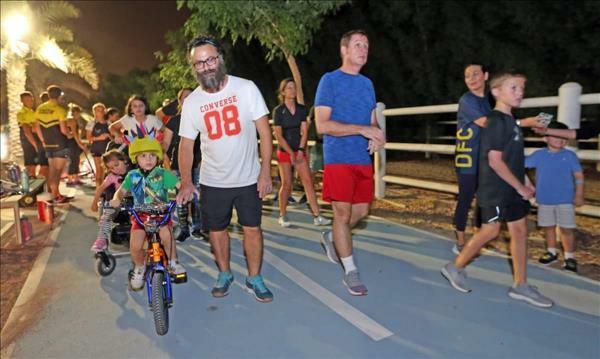 Organised by Team Angel Wolf, a Dubai non-profit group, the event will be held every Sunday for Dubai Fitness Challenge to raise awareness of how people (especially children) of determination should be included in fitness activities. On its first day, the event saw parents exercising with their toddlers' strollers, children on their roller blades and scooters, and seasoned athletes who joined the social run session and helped push disability chairs. Zendaqi said bonding with people over sports is what improves the experience. "Sports is about empowering one another to become better together. Running with a chair adds extra challenge to the exercise, but it is also empowering for me to build more strength while adding happiness to someone else and encouraging them to be healthy," said Zendaqi. Serbian personal trainer Vladimir Djunisijevic joined the community event with his nine-month-old toddler and wife. He had taken a challenge to do 365 different activities in 365 days. "I take my son Javelin to my activities to expose him from a young age to sports. Exercising makes you a disciplined, confident person who's able to lead an efficient life mentally and physically." For his 365-day challenge, Djunisijevic practised all kinds of sports including horse riding, volleyball, paddling, fly boarding, karting and weightlifting. Meanwhile, Nick Watson, founder of Team Angel Wolf, said the initiative aims to give people a hands-on experience on helping the determined ones and contribute to making labels disappear. "A lot of individuals want to support but don't know how to, so sport is a good way to start with," said Watson. The session is in loops, so participants can join in and out of the session as they wish. "The whole focus is to inspire society to understand people of determination, while looking at their own health and nutrition. Hopefully our story makes a difference," he noted. Sherouk Zakaria "Born and raised in UAE, Sherouk Zakaria is a Senior Correspondent at Khaleej Times. Joined since May 2016, she covers Dubai Municipality, Dubai Electricity and Water Authority (DEWA), special events and humanitarian issues. Her choice of journalism as a career stems from her passion of telling people's stories and writing to inspire or make a difference. In her free time, she's an occasional theater and film actress. Sherouk received her BA in Mass Communications from the American University in Sharjah in 2013. Before joining Khaleej Times, she was a senior lifestyle/entertainment editor for a magazine in Dubai."